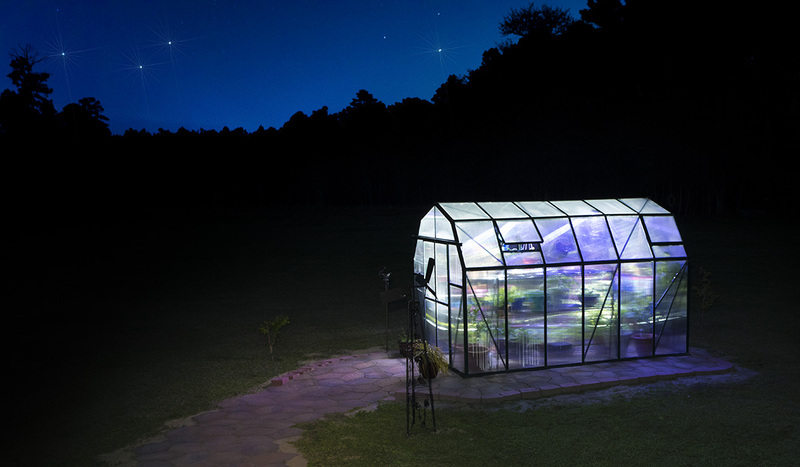 I’ll spare you full details on assembly so you can just relax and enjoy this view of our Grandio Greenhouse at night. The photo’s not perfect, obviously, but here’s a look at how I took it. I’m confident just about anyone can improve on this hybrid strobist technique. Unless I’m wrong, I did a better layering images for the cover of The Year Santa Came Back. Let me know if you agree. The background and stars are the foundation, so I’ll begin there. I live southwest of Fayetteville and there’s a lot of tungsten light pollution. Unfortunately, I was pointing the lens directly in that direction, so I waited past dark. Way past actually, when some of the business lights finally disappeared. There was a slight haze, which reflected that warmth, too. Even a few clouds can make this an exercise in frustration. Then there’s the moon, all combining to make planning critical. Pick a clear night, wait for the stars to finally show through and start shooting. I went with ISO 1600 on my 5D MkIV. Aperture was 5.6 on my EF 17-40L. Shutter speed was 30 seconds and I anchored the tripod solidly atop a ladder. Bring a headlamp, by the way, focus before dusk and wrap a rubber band around the lens’ focus ring to minimize the chances it moves unexpectedly. It’s a good backup weapon if that bear shows up again and besides, autofocus probably isn’t going to work. I took about 50 photos to get at least one workable image. That’s never a sure thing, so I suggest you also bracket early and often. Sneeze while on that ladder and everything’s blurrier than Fear and Loading in Las Vegas’ opening scene. The murky yellow tungsten glow is unavoidable in my case. I hope you’re luckier, but if not I’ll explain how to tame it later. I hid two Brilia BB-110C bare-bulb flashes behind huge tomato plants in the greenhouse. There’s a joke in the fact that they’re my wife’s tomatoes, but this is a family blog. I used a pair because at 80 watts they lack a little in power, and jokes like that need a punchline. Pocketwizards were attached to trigger them from my lofty and distant perch. I was probably 30 or 40 feet away and 10 feet, up, in the dark. Lack of wind minimizes blur in the background trees, but it’s also good during this kind of blind trapeze work. Another Pocketwizard attached to my camera set off the flashes when I hit the shutter. Exposure was adjusted to less than a second for the lighted greenhouse effect in the photo. I bracketed aperture to avoid getting off the ladder to dim or brighten those interior lights. Sorry, I didn’t want to climb that ladder 50 times. Once I’d captured the next batch of images, it was time to pull everything into Photoshop. I found one background/stars image I liked and opened the RAW file. You are shooting in RAW, right? I then rolled the white balance setting to “tungsten,” which killed that ugly yellow glow. This one has more to do with personal preference, but play with the contrast and highlights until you like the stars. After that adjustment, and once the file was open, twinkle was added with the Topaz Labs Star Effects filter. I still haven’t mastered it yet, largely because it has too many sweet options to remember. Now I opened the greenhouse images, playing with the white balance settings until I saw something I liked. Once open, I selected all, copied and pasted as a layer onto the much-darker stars image. I then used layer masking to create the final image. I composted the other 98 or so images. Well, actually I deleted them from my computer, because they stink too bad to let into the greenhouse and I don’t think anything could grow from that mess. gsagi on Pisgah covered bridge haunted? Steven J Zimmerman on Pisgah covered bridge haunted?